"Combined with the humble, low-key, unheroic performances, and the power of the dark, we have a remarkably consistent body of work that transcends the expectations of each genre in which he worked. It's as though the characters in a genre piece are being observed from outside." A swift paragraph on the supernatural in movies and then let's dive right in to this packed Blu-ray – it's no understatement to use the phrase 'treasure trove'. We Night of the Demon fans salute the producers of this definitive double disc release. Most films rely on an internal logic that is set up quickly and established. Break it or confound it at the wrong moment and the spell of all the filmmaker's hard work can be irrevocably broken. In an oft referenced and very famous horror film, the plot clearly illustrates the protagonist going quietly insane in a cavernous hotel with only his and his son's visions giving us a taste of what's 'not quite right'. But it's safe to say (at least I thought it was safe to say) that Jack Torrance's problems are manifest in his own fracturing mind. Uh, no. In the last act, he is released from a locked storeroom by a ghost. Ghosts are real. Live with it. Except that I couldn't. We'd had over ninety minutes of a mind splintering in front of us and now we have to make the leap to 'ghosts are real'. I couldn't make that leap. There were not enough signs of a practical reality to the supernatural in The Shining. In The Innocents, a blob of water suggests the reality of its own ghosts but my reading of that film is that sexual suppression is swirling inside the governess' head and all the horror is self-generated. I understand I may be in the minority with this opinion. But if you're going to make a film supporting the concrete reality of the supernatural then adopt the way of Bill Bull (aka Guillermo Del Toro). With no recourse to seeing a ghost from anyone else's perspective except the camera's, Del Toro shoves an animated dead boy in our faces at the start of The Devil's Backbone, seven minutes in. So now we know and can not exactly relax but we know the supernatural exists so the internal logic of the movie is established. Night of the Demon's dark drama rests on the duel between the rational and irrational and lets us believe, in the film's own world, that monsters really exist almost right off the bat. Here, with no equivocation, is a monster! There are a few examples in the film that dark forces are manipulating our world of reason but that's part of the fun of it. The last line of "Maybe it's better not to know..." hedges the film's bets, a line wrongly delivered by the star, Dana Andrews while inebriated according to producer Hal E. Chester. It was originally the somewhat patronising and even sexist "Maybe it's better for you not to know..." delivered at co-star Peggy Cummins but I think it's safe to say that evil is evidently real and manifest in Jacques Tourneur's glorious Night of the Demon. Jacques may disagree and I am sympathetic to his original ambition for the film but we do have a demon, ladies and gentlemen. Let's go with that. Kept alive by the séance audio sample used to open Kate Bush's Hounds of Love ("It's in the trees... It's coming! "), Night of the Demon has never strayed too far from my imagination or memory. Yes, I probably saw it first in a late night slot on BBC 2 as a 'mild' example of a horror film and that was just too attractive a proposition up against the choice of bed and a few pages of C.S. Lewis. I was too young to register the Christian subtext of his Narnia double-trilogy but at exactly the right age to let the demon in. Why is the dark side so much more attractive? In a supreme irony in celebration of Jacques Tourneur's wonderful tale of the supernatural, the most well known aspect of the film – which adorns the cover of this Blu-ray, the demon itself – had very little to do with Tourneur who wanted to evoke the supernatural far more subtly. Tourneur in many interviews has disowned the creature as dumbing down his own vision for the movie. He'd always planned on the presentation of an ambiguous "Did I just see what I thought I saw?" and letting the audience leave the theatre with as much ambivalence as the film's characters. Several reports state that the creature was in the script, bold as brass and waiting to be realised. There are certainly sketches of the creature by designer Ken Adam because they are in the film itself. I've managed to find one page of the screenplay. Working on finding the rest. A woodcut page torn out of a book of "an awful demon creature," is as far as the original story offers. We'll never know if Tourneur would have succeeded or not but surprisingly against my default pro-filmmaker, anti-studio interference stance I have to say that the demon itself makes the film so, so memorable. Yes, it's on screen for too long using less than cutting edge special effects; it loses focus too readily if the beast was as big as it's supposed to be; and its final appearance could have been shot at a higher frame rate so it looked less like a man in an ill-fitting demon suit raking a bean bag doll to death and then dropping it almost clumsily... and yet it still works despite itself and sound has a lot to do with that. In post production it's often stated that a horror movie's superpower is sound. 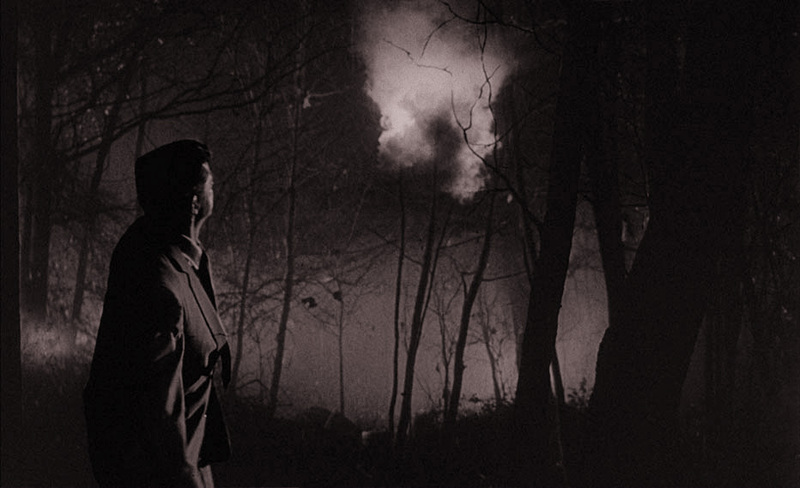 Well, Night of the Demon was made in 1957, two decades before the word Dolby ushered in the cinematic aural revolution but the demon is heralded by a sound effect that reactivates the memory so precisely. I don't know what the sound is but I'd describe it as whistling wing beats, an unoiled wheelbarrow travelling at speed, satanic castanets... Whatever it is, it's potent as hell and despite its battle with the score in the demon's top and tail appearances, it's eerie and very specifically unsettling. Curiously the demon makes no organic sound of its own. For the divided camp of Demon enthusiasts who see the creature as an obvious puppet on one side and those on the other who still have their inner eight-year old shuddering with fear on high alert, one thing is for certain. The movie works and the simple existence of this packed Blu-ray tells you that this sixty-one year old, old-school horror is well loved and deservedly so. A fearful man drives at night to a country house where he pleads with the owner to stop an unspoken malevolent force from hunting him down. The owner appears to reassure the man and sends him on his way but we know he's being duplicitous. As the man arrives home, a sound and a trail of smoke from far away signal the arrival of a fearsome demon. Petrified, the man backs his car into an electricity pole and appears to electrocute himself. There seems to be no doubt about the reality of the beast that attacks him. We are thrust into the world of the film and in that world, here be demons! 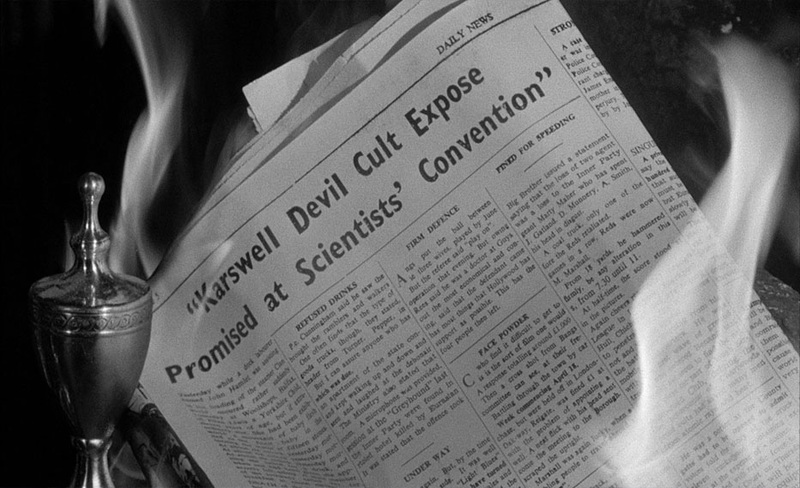 A rational psychologist, Dr. John Holden (an upstanding and suave Dana Andrews) is flying to the UK to debunk the work of country house owner Julian Karswell, (played with delight, malice and fear by a superb Niall MacGinnis), a Satanist who silences his critics by passing on a series of runic characters to those he wishes a fire demon to despatch. Once Holden arrives, he finds that the man he was set to meet (the first victim, Professor Harrington) has died and that his niece is suspicious of the circumstances of his demise. Little by little, Holden is drip-fed snippets of information that require him to realign his scepticism. Here is a rational man whose self-composure and confidence is taking a beating. The threat of demonic death can do that to even a hardened atheist. At a chance encounter at the British Library (which is anything but) Karswell passes a slip of paper with runic symbols on to Holden. This is the curse that is meant to lead to Holden's death. Dressed as a clown after entertaining children with 'magic puppies', Karswell, replete with satanic beard, summons forth a wind storm so ferocious, tables and chairs are sent flying into the fleeing children. In 1957 health and safety was confined to agricultural equipment while folks drove with no seat belts and you could open a train door at speed. Those kids took a hammering. It's glorious (in the sense that children should never be molly-coddled and always have furniture blown at them at high speed). It would not surprise me in these ridiculously sensitive times if I were reported for supporting child cruelty for that remark. I refuse to smiley-face it and will throw myself on the mercy of the more discerning and humour-aware readers of this site to figure out that I want children to climb trees and not be mollycoddled to avoid life itself because it might be dangerous. Holden, who has his eye on Joanna, the first victim's niece (played winningly and strongly by Peggy Cummins) gets nervous when the runic parchment starts behaving suspiciously. Taking the threat on board, Holden and Joanna try to unravel the mystery before it's time for Holden to face the demon. There are several stand-out scenes. Mild mannered Mr. Barraclough from Brit sit-com Porridge, a young Brian Wilde, plays a member of the cult who has been sectioned after apparently murdering someone. 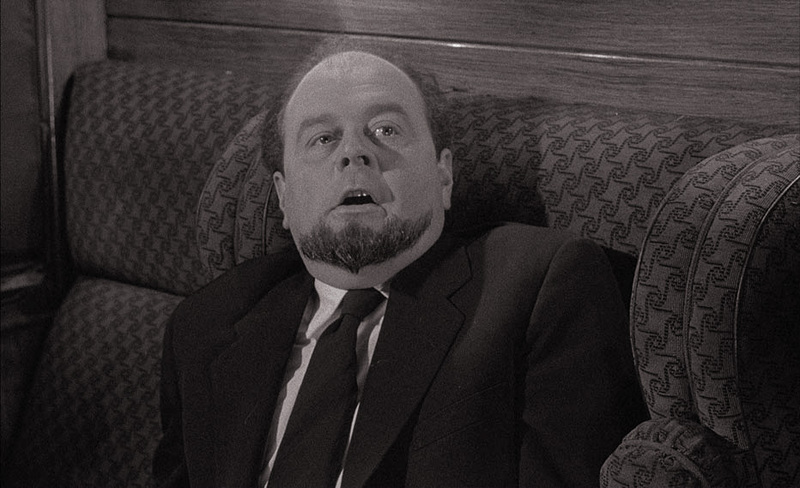 Not only is his screaming fear about as real as any actor could make it, his hypnotic interrogation is truly gripping. The famous séance in which we hear the Kate Bush sample, had Peggy Cummins and Dana Andrews behind the scenes in hysterical laughter throughout. This is hardly surprising. When the voices of the dead come through, they are creepily the actual voices of the departed souls, well performed and lip-synced by Mr. Meek (Reginald Beckwith). The whole scene is shot through with patent and celebrated absurdity. The song 'Cherry Ripe' both women belt out enthusiastically to summon the spirits is England at its most ridiculously eccentric. And it's just lovely. Mr. Meek channels a few odd spirits (a Native American spouting gibberish and a friendly Scotsman) but it's his loyal wife I just could not take my eyes off. With her own eyes closed for most of her appearance, Rosamund Greenwood is just mesmeric (this could just be me). She has that buttoned down middle-England, no nonsense attitude introduced with just a peck on her husband's cheek and a few lines of the ridiculous song delivered with an excess of verve. Missing in the shorter version is the entire scene involving Holden visiting the cult member's family in the countryside. In a Ken Adam designed set, we see the entire rustic group all portentously in thrall to the black magic they have signed up for. Framed by huge, low beams, the whole scene drips with menace, one that becomes explicit as soon as the runes jump out of Holden's wallet. As Holden leaves Karswell's home at night, the swirly, smoky images that foreshadow the demon seem to chase him away. It's all the more unsettling realising that this is the sort of stuff that would have replaced the actual demon if Tourneur had the right of final cut and not been royally stitched up by his producer Hal E. Chester. On the downside (yes, there are one or two), it is such a shame that the 82 minute cut all but jettisons Karswell's mother, played with real concern and enthusiasm by Athene Seyler. Editing is such an extraordinary craft and the 14 minutes lost play havoc with some scene orders. There are subtle differences between each of the presented cuts and I am thrilled that Jon Robertson has done an excellent compilation of all the differences (subtext; so that I don't have to...) We've acknowledged the obvious cut-rate effects of the demon itself but there's another example of, let's say, not the most convincing special effects when it comes to a feline attack. Darkness is this scene's only real friend and Dana Andrews does a sterling job of convincing us that the threat posed by the big cat is real but there are one or two moments where it is startlingly obvious he's manhandling a stuffed leopard. The edit is fast and furious and the shots swathed in shadows are eerie and effective but as I say, a few frames let the side down just a bit. I channelled Rod Hull and his emu reluctantly there for a moment. Remember, if something is perfect, it's impossible to love. And Night of the Demon gets a lot of love from Outsider. I believe Slarek is just as passionate about the film but I won the toss. An intelligent, chilling example of English macabre with fine performances and memorable demonic imagery and we never find out the identity of the person whose hand comes eerily into shot twice following Holden around Karswell's darkened house. I had no recollection at the time but I must have been influenced by these two shots back in 2003 because there's an homage in my own film as one of the two leads is being followed by the other. Jackie Sawiris disappears around a corner and the camera pans to reveal Jocelyn Brooke-Hamilton's hand... It only just occurred to me that I must have subconsciously stolen it from Demon. Always steal from the best. This jam-packed Indicator Blu-ray features two discs. Special Features: Everything including the kitchen sink – a Brit phrase. And not an amusing one at that. How about 'Shed loads!' That said, I must find a copy of the script to put a few conflicting stories to bed. For completists only: According to screenwriter Charles Bennett's letter to Danny Peary, author of Cult Movies, the name change by Columbia from Night to Curse was made so that the poor uneducated cinema-going public wouldn't get confused between the British horror film and the Burton/Taylor drama Night of the Iguana. Hmm. Elizabeth Taylor wasn't in Iguana and it wasn't released until 1964, a good six years after Demon hit Stateside. Hmm. More research required methinks. The IMDb lists that the film was shot and projected in the 1.85:1 ratio. The Kinematograph Weekly published in 1957 lists the 1.85:1 ratio, Columbia's 'house ratio' at the time. 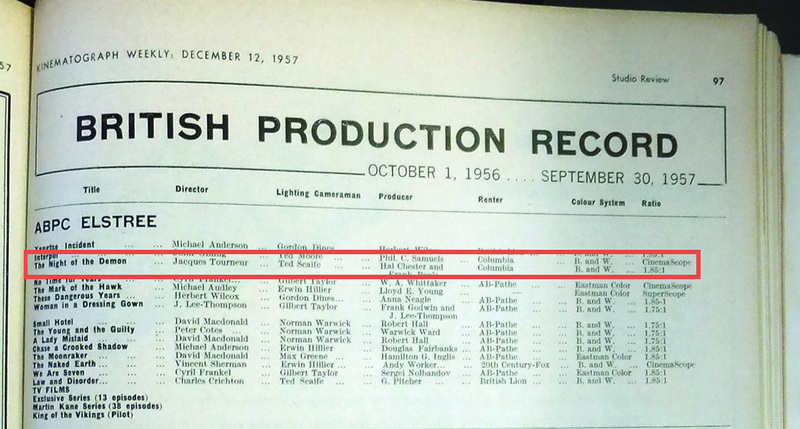 According to Indicator's booklet there was no official documentation regarding the film's aspect ratio and 1.75:1 was chosen based on the already remastered 2K BFI long version. There's no full stop after the W. initial and the same title appears before the two US versions of Curse. I quibble. It's unbecoming of me. Disc 2 offers both shorter UK and US theatrical cuts at the 1.66:1 aspect ratio. 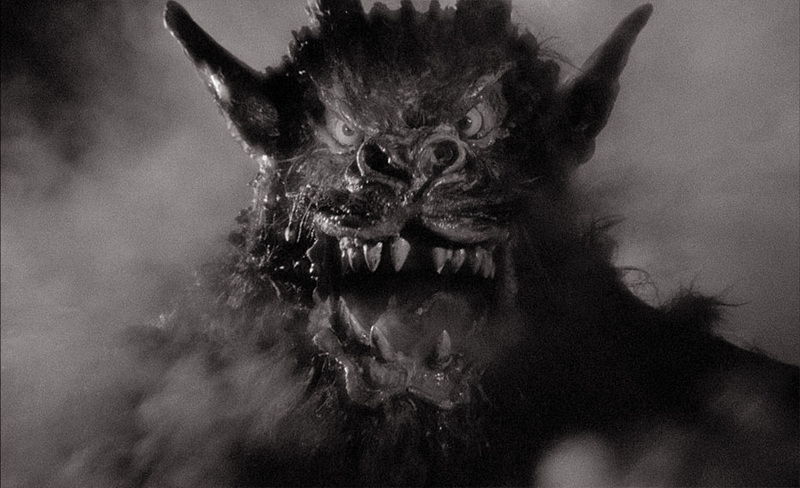 Each of the four versions of Night of the Demon looks crisp, sharp and as good as the movie has looked for some time. It's not pristine (some scratches and dust spots inevitably escape the restoration) but the 35mm format never ceases to amaze, with lovely detail from the original photochemical image. I do believe that a 4K transfer would reveal even more detail but perhaps that's just me romanticising the extraordinary quality of 35mm film. 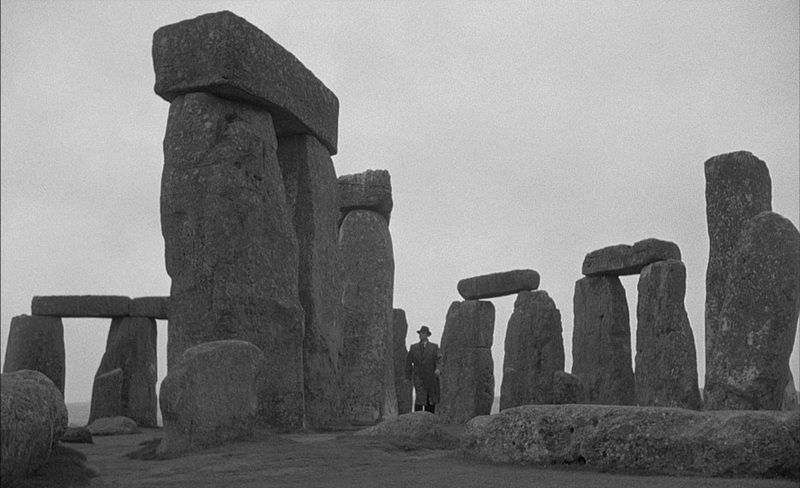 Shadow (which could've been Jacques Tourneur's middle name) is served nicely by a well-balanced contrast ratio with darkness helping more than one of the spookier sequences and inherent grain is hardly noticeable. The original mono sound is clear with no intrusive hiss – I am unaware of how much work may have gone into making the original sound so clear and alive. I am consistently amazed at how well these older soundtracks stand up. The score and effects are rendered full throated with an obvious absence of the lower register. Not sure when sub-woofers were invented but I'm pretty sure it was after 1957. There are optional English subtitles for the deaf and hard-of-hearing. I simply cannot imagine a dedicated fan wanting to know anything more than Earnshaw offers up in this meticulous commentary. This isn't the off the cuff ravings of a fan (though a sincere fan he certainly is) but a measured drip feed of information (one assumes lifted from his own book) and it's never inappropriate or uninteresting. I always make the mistake of listing the 'good bits' of a commentary and I'm aware that I'm rather pathetically proving that I listened to it but trust me, if you are a fan of this fantastic film and you can't afford the book (see later) then this commentary is wonderful. This is a terrific, if short inclusion with some great interviews and altogether a worthy addition to the appreciation of Night of the Demon. It fascinates me to imagine what Demon would have been without the demon (a classic case of producer vs. director vying for their vision to be victorious). 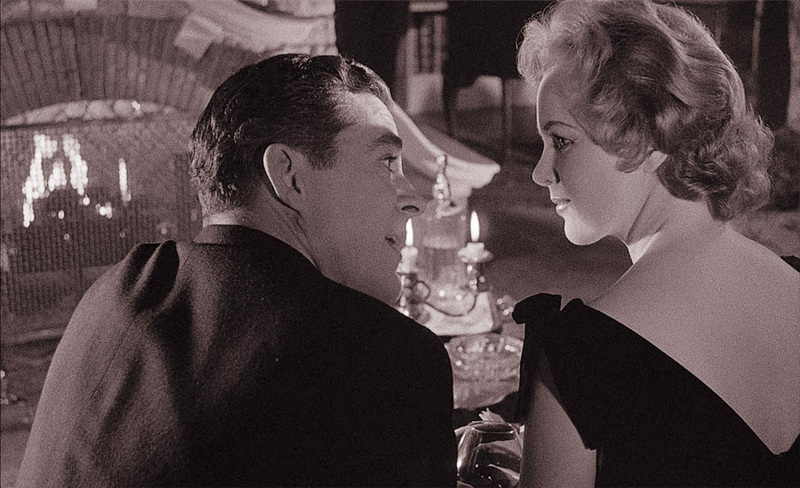 Designer Ken Adam baldly states that a great noir was ruined by the inclusion of the demon. Hey, Ken, you designed it! Again, playing Satan's Silk, I'm not sure that's the case. I was too young and too affected by the film and its demon to discount the monster. I was surprised to have what promised to be a treasure trove of behind the scenes info to be suddenly over at just twenty minutes. It seems to have been made for an aborted DVD release of the movie back in 2007. This is a real gem and from a purely selfish point of view it is more than welcome. If there are different versions of our most beloved films and we review them on Outsider, it's the hardest job to get right... to nail down the exact differences in the cuts offered. Here, it's done methodically and expertly by Jon Robertson and with a full understanding of the filmmaking process. Not often understood in our digital world is old-school filmmaking's counter-intuitive process. We take the most important item of our work, the original negative into which every bit of money, energy and creative inspiration have been poured, and then we cut it up into little pieces. Once the original negative is cut, using key numbers printed into the film stock as reference guides, the frames cannot be re-joined because film cement works best if cemented 'on' to film spacing and not 'to' (too little surface area for the cement to do its job). So adjoining frames are scraped clean to apply the glue and so frames are lost in the process. You get the invisibility of a cut due to the negative being cut in two rolls, A and B, perfectly in sync but one roll contains all the even shots and, well... you get the rest. Light passing through the two rolls onto a third print stock creates seamless joins at the cuts. Well, it seems Night of the Demon had its negative cut at its 96-minute length and to incorporate the re-cut and excision of 14 minutes, different takes had to be used to make some changes possible. Cutting out shots is no problem but if dissolves are involved, that's a different story. But the recut down to 82 minutes is no simple excision. The film has different close ups inserted to tighten scenes and therefore you are watching second choices not made by the director I assume but by an editor ordered to get its length down to fit into a double-bill's 82 minute time slot. There's a nasty transition – a cut into a dissolve – in the shorter version that screams "No time! No money!" The conclusion has a lovely few observations and I don't think I'm spoiling anything by stating them here. Firstly, the reputation and dare I say fan-love for this film was mostly due to the cut down version being more widely seen so we have it to thank but to have access to both cuts must be seen as "a twist that few who made the film would have seen coming..." In fact, my first viewing of the film for many years, there were scenes that I had forgotten... or had I? Perhaps I was watching those scenes for the very first time. Writer and movie champion, Christopher Frayling highlights Demon's scriptwriter, Charles Bennett and the work he did with Alfred Hitchcock in the 30s. He is dismissive of the monster ("like a bunch of bananas!") but finds the film one worth championing for all of its classy elements. He has a wealth of information on original ghost story writer M.R. James (more famous to us at Outsider for authoring 'Whistle and I'll Come To You, My Lad' the basis of Jonathan Miller's superb adaptation for the BBC). His enthusiasm for the unloved movie – as in films not recognised for being more than they first appear – is at full throttle here. He speaks of production designer Ken Adam with great fondness and describes how Demon was a bridge from his designing ships of old to get to the worlds of Bond and Kubrick. I also love the idea that Adam was shocked by the cult that has grown up with Demon, so much so that this revered gent was given an exhibition of his work in 1999 at the Serpentine Gallery and the organisers said that his work on Demon must be the first thing visitors see when they arrive. Lovely. A very good extra, again edited and shot by Jon Robertson as are most of the extras. Bravo, Jon. A verbal essay by the erstwhile Edinburgh Film Festival director, the well-informed and enthusiastic Chris Fujiwara. 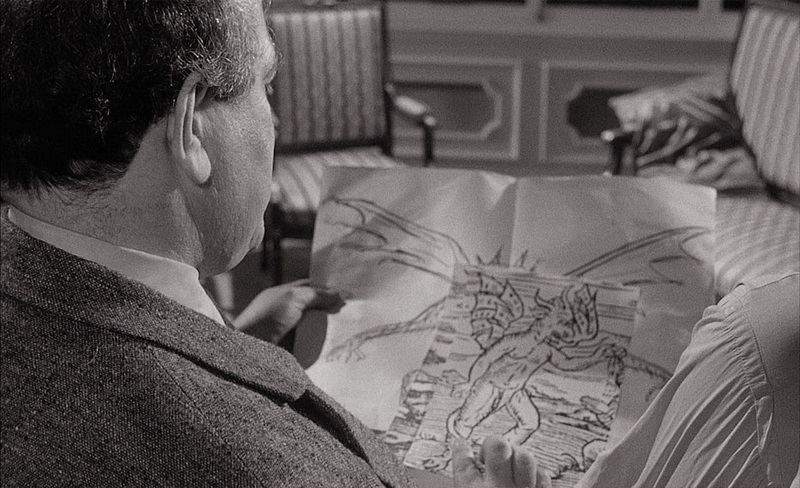 Interspersed with many clips to illustrate his points, this is a detailed extra with a ton of information specifically on Demon's director, Jacques Tourneur. Famous for his horror credentials, Kim Newman gives us his take on the context and the quality of this humble masterpiece. He states that the special effects (meaning the demon) stand up against the average Godzilla movie at the time. Uh, OK. He brings up a great point that while the script isn't quotable, it is, in context, beautifully written. While Newman prefers Demon to the other two classics of the era, The Haunting and The Innocents, he does concede that technically the other two would pip Demon at the post. I concur but love all three almost equally. Must get to see The Haunting again... Those door smashes! Newman is hugely knowledgeable and gives a few original thoughts to the appreciation of the film. Campbell's enthusiasm and love for Night of the Demon pour out of him in this brief interview. He talks about getting Casting The Runes by M.R. James out of the local library (on his mother's card) and reminds us of a scene he says would be un-filmable –not sure about that. The hero reaches under his pillow and finds a mouth with teeth and surrounded by hair, not a human mouth... Sounds like a job for Rob Baker... It's a real kick to hear about his youth and sneaking into cinemas. He noted that the same print with the same few words of Coleridge missing was shown in Liverpool at the time. I love and will finish with his observation "If you want to keep your kids quiet, hire a demon!" So say we all! An American perspective from Scott and it's kind of endearing how mostly middle-aged men so fondly recall Famous Monsters of Filmland, a magazine cited by most US genre directors as an influence. Scott also mentions that recording the soundtrack on quarter inch tape from the TV was the only way to revisit films before home video. God, I used to do that too. One of my happiest memories was saving up for and eventually buying a shoebox sized cassette tape recorder for the princely sum of £14.00. Scott describes how his enthusiasm led to the discovery of the longer version and Hal E. Chester the producer comes in for some veiled criticism. Scott delineates the difference in character between the story's Karswell and the cinematic version so memorably played by Niall MacGinnis. His memories of how film screenings were so much more valued echoes my own experience and this is a lovely way to spend twenty odd minutes finding out more context on the time in which the film appeared. All you want to know about ghost story writer M.R. James and his rivalry with Oscar Browning (the suggested basis of Satanist Julian Karswell). Clarke knows his stuff. He reminds us that the lazy assumption that Karswell is based on noted occultist Aleister Crowley doesn't hold water because of timing. Class, sexuality and academic achievement all point to Browning being the inspiration for Karswell. David Huckvale takes you through Parker's CV and he was known as a safe pair of hands. According to Huckvale, Clifton Parker scored 50 movies. And yet he remains uncelebrated. IMDb lists 85 but who's going to argue that point? I have so much respect for composers who are able to sit at a piano and dissect a score. Huckvale knows his stuff and is able to give a tremendous breakdown of Parker's work. It's funny to hear Huckvale talk about what was musically forbidden. The idea of musical tropes being forbidden is fascinating to me. Very similar to the extra that came before, this is another examination of Clifton Parker's score for the film. With simple piano examples of the main themes, McQueen explains the perceived origins of the so-called 'folk' Irish music that rattles around Dana Andrews' head. Another gem, this time recorded in 1972 by long term fan Scott, it's clear that both Andrews and his wife Mary Todd are very comfortable and it's a fascinating listen. Andrews claims that the demon wasn't in the script. I really want to get hold of a copy even more now. "I'll tell you what ruined it, the goddamn demon!" says Andrews. Boy, there's no love lost between producer Chester and Andrews. Scott gets Andrews to explain what was then to him, the missing 14 minutes. This is a candid conversation, fascinating for fans. Aaaah (as in "Lovely!" not "Scared!"). 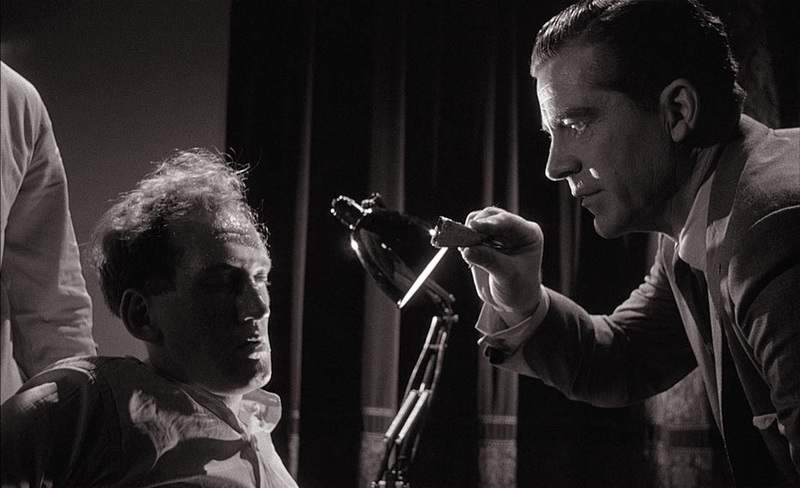 The great Michael Hordern and M.R. James together again. Hordern was the star of the afore mentioned BBC adaptation of James' Whistle and I'll Come To You, My Lad. I had intended to read the original inspiration for Night of the Demon but this way of taking in the original short story was very welcome. Character names, the paper with the runes and a woodcut of a demon are about the only things both story and film have in common. But like Blade Runner and source novel Do Androids Dream of Electric Sheep?, both story and film strangely but satisfyingly compliment each other. 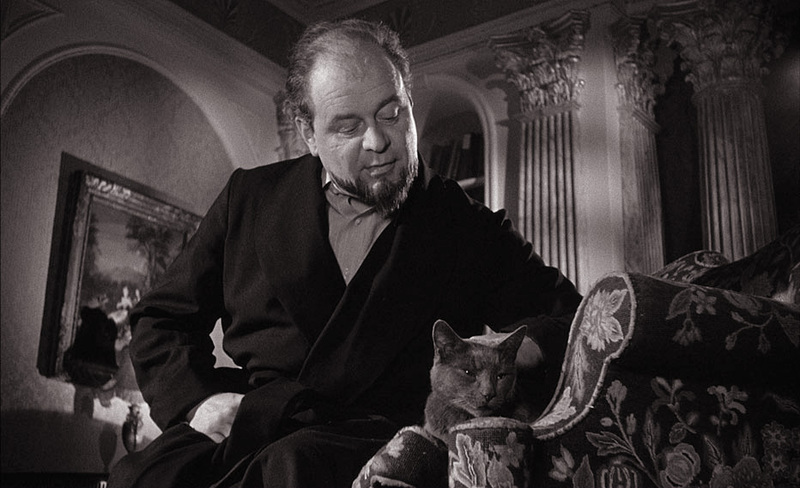 After hearing the story, I could see how the original may have really appealed to Tourneur, a director more in love with the suggestion of the shadows rather than the nuts and bolts physicality of your actual demons and cat creatures. Having just had the story expertly read to me I might have thought it was overkill to listen to a dramatised version of it straight after but it's terrific. Is that Orson Welles or a soundalike doing the introduction? The acting is solid if a tad on the overly dramatic; the music and sound effects are extremely effective except for the running footsteps of a frightened man, an effect that sounds like someone with a thimble on two fingers being tapped on a wooden tray. But it's fun, all the same. Well done! Someone found the M&E track. Still puzzled what value this brings but then is there a CD of the score available? Just checked. You can get the Main Theme on a compilation CD of composer Clifton Parker's work but I guess if you want the whole thing with effects, then this is it, in all its late fifties' recorded and restored glory. In some scratched disrepair but in its own way almost cute, is the Super 8mm version of the film that has no time for scene setting or atmosphere! Shot one, title shot, shot two, demon! And off we go. It's in black and white (of course) but also silent, a double whammy. Block capital subtitles fill in the details as we rocket along through the narrative. We see the runes and the cat-fight (we are merely 4 minutes and 30 seconds in here) and with the exception of the conversation between Holden and Karswell on the train, most of the final sequence is intact. What effect this may have had on a domestic audience of the late fifties cannot be appreciated in 2018 but it does make a mockery of the subtlety of the original. But it has its charm, for all that. Well, you know how a lot of people have complained about modern trailers giving up all their movie's secrets... Well, most of the final sequence money shots are here including the shot mentioned by Scott MacQueen in the extra The Devil Gets His Due. An obviously abandoned early effects shot of the demon looking more bat-like shows its scary head but so too are shots from scenes cut from the US release. So this one's a curio, for sure. This set comprises of; 33 black and white production stills, 6 (shown in 3 sets of 2) black and white publicity shots, 1 demon, 1 demon maquette, Ken Adam's 6 set drawings and 1 demon, 1 Front of House shot of the demon and 8 colourised Front of House shots. Lastly there are 16 poster designs from all over the world. Wow, 80 pages! And this is a beautifully produced booklet, handsomely laid out and printed on high quality paper, the sort of thing you wouldn't have an issue paying money for if it was a stand-alone publication. The long title above is lifted from the press release, and gives a flavour of the quantity of material included, if not the quality, which is consistently high. There's an impressive range to the articles included and some fine illustrations, including stills, concept art, press materials and even a reproduction of the BBFC 'Exception Form' for the film. A good evening's read and another treat for fans. Also included in retail package is a double-sided fold-out poster with Night of the Demon on one side and Curse of the Demon on the other, printed on a weight of paper that sits somewhere between regular notepaper and thin card, which gives it a feel of quality and makes it feel robust. As alluded to earlier, Danny Peary, author of Cult Movies and Cult Movies 2 got a letter from Demon screenwriter Charles Bennett asking why on Earth was his movie not included in the first volume? It was a valid question. It was hastily included in Volume 2 with his letter reproduced. 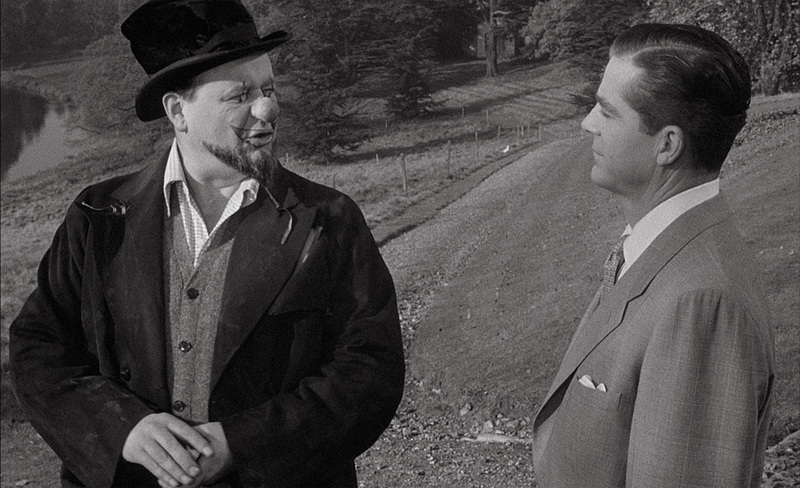 Well, Indicator has set an extraordinarily high benchmark with the extra features in this Blu-ray release. Information on the film is not as bounteous on the internet as some may think so this wonderful release satisfies fans beyond any level of expectation. 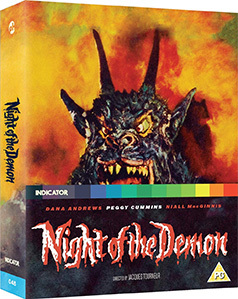 The book on the making of the film, 'Beating The Devil: The Making of Night of the Demon' is selling on Amazon for about £220 which is a little over Outsider's research budget of ten bob and a toffee apple. Both Slarek and I find we usually have any of the relevant film books we need but that one slipped by me. I would imagine that most of the gems from the book have subsequently found themselves on to this Blu-ray very probably on the author's own commentary of the film. Am still halfway through the extras (not any more, all done, wonderful) and loving them. For fans, it's an early Christmas!